Thomas Minerd was born on Jan. 16, 1866 (or 1870) at Mt. Braddock or Wharton Furnace, Fayette County, PA, the son of William and Sara Elizabeth (Whoolery) Minerd. He was a longtime laborer in the coal mining industry. Thomas married Katherine "Kate" Ramsey (1869-1908), the daughter of John E. and Eliza "Lizia" (Riffle) Ramsey. They produced 10 children -- Charles Thomas Minerd, William E. Minerd, John Dow Minerd, Lorenzo "Wade" Minerd, Myra Manila Kennison, Grace Kennison, twins David and Flora Minerd and two others. Sadly, John, David and Flora are known to have died in infancy. Tom was a coal miner and pit boss for many years in and around Smithfield and Uniontown, Fayette County. He and Kate are said to have lived in 10 different places in the area. Complicating their lives was the fact that Kate's older brother, Jack Ramsey, was a member of the notorious Cooley gang which committed brutal robberies throughout the coal region. Jack's role in the crimes made sensational headlines, but drew in the Minerds as innocent bystanders in an 1889 incident. Later, Kate learned that after a night of heavy drinking, her brother and his gang had viciously assaulted and robbed her uncle Joseph W. Anderson. The incident was even more sensational because the uncle had raised Jack in the first place, and money had been taken from a secret hiding place in a false drawer in the uncle's home. When Jack was brought to trial in December 1892, Kate and her uncle testified. Jack also was found guilty of robberies at the homes of the Prinkey and Dils families. In 1901, when living in Uniontown, tragedy struck. Their 10-year old son William, seen here, was accidentally shot and killed by a friend playing with a toy pistol. The Uniontown Daily News Standard reported that "The boys were playing 'Buckskin Bill' when the accident occurred and were using blank cartridges. [The friend] then placed a buckshot in the pistol and fired at his companion, without realizing the danger, the ball striking him in the back of the head." Funeral services were held in the Minerd Chapel in Uniontown's East End, now known as the Calvary United Methodist Church, founded by a cousin, the famed "Blacksmith Preacher," Rev. David Ewing Minerd. Sadness blanketed the family again on New Year's Day 1908 when the 36-year-old Kate died at their home on Water Street in Smithfield. Having suffered from pulmonary tuberculosis in the lungs for some seven to eight years, and recently having given birth to their 10th child, she was confined to bed the day after Christmas 1907, and her health declined rapidly. She was eulogized by the Daily News Standard as "a woman of wonderful energy, being a fine housekeeper and great worker. All her children are small except one son...." The Uniontown Morning Herald added that "She was a daughter of Irvin Ramsey, of Vanderbilt, Pa., and a niece of L.D. Ramsey, of this place." Her funeral also was handled by Rev. Minerd, with interment in the Hopwood Cemetery. 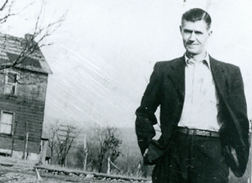 As a widower, Tom continued to work in the coal mines in the Smithfield-Fairchance region. He enjoyed spending time with his children and grandchildren. He is known to have visited his brother, James "William" Minerd, either in Uniontown or at William's home in Warren, Trumbull County, OH. Click here to see a photograph of the two men together, likely taken in the late 1920s or early '30s. Seen here, Tom sits in a favorite chair on a porch while watching carefully as a grandson plays in the foreground. Note the water pump in the right hand side of the image. When the federal census was taken in 1920, the 53-year-old Thomas and 17-year-old unmarried daughter Grace made their home together in Fayette County's Springhill Township. His employment was listed as "driver- coal mines." Residing a few doors away was his married daughter and son in law, Myra and Ray Kennison, and their young daughter Edith. In September 1925, the Ramseys held a family reunion at Sheets Hill, Fayette County. A bounteous meal was served, said the Daily Courier. Son and daughter in law Charles and Perie Minerd and their children attended the event, and Perie was elected to the committee on arrangements for future reunions. Tom outlived his wife by more than a quarter of a century, and buried five of his children. He died at the age of 63 on May 3, 1933 at home near White House, outside of Smithfield. The cause of death, said a Uniontown newspaper, was "a complication of diseases," and his official Pennsylvania certificate of death reveals the details that he suffered from heart valve problems ("mitral regurgitation") and kidney disease ("chronic interstitial nephritis"). Following funeral services held in his home, he was laid to rest beside Kate at Hopwood Cemetery near Uniontown. His obituary was published in the newspapers of Uniontown, which noted that he was survived by 17 grandchildren. 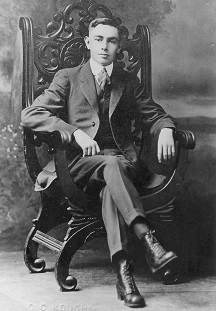 Son Charles Thomas Minerd (1889-1953) was born on March 4, 1889 in Brownfield, Fayette County, PA. He married Perie E. Monteith (1891-1976). They had four children -- James Thomas Minerd, Alice Conn, Virginia Minerd and Charles Irvin "Bud" Minerd. 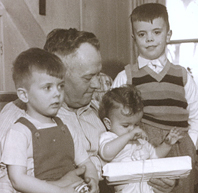 He is seen here with his grandchildren, unwrapping presents at Christmas. Charles registered for the World War I military draft in 1918, and stated his occupation as a driver in Mine 4 of the Baxter Ridge Coal & Coke Company. Two years later, when the federal census was taken, he and Perie and their three eldest children lived in Georges Township, Fayette County, where he was employed as a miner with the Trumell Coke Company. Heartache rocked the young family on Jan. 12, 1916 when 13-month-old daughter Virginia died after contracting whooping cough and bronchial pneumonia. An obituary in the Connellsville Daily Courier reported that the funeral was led by Rev. W.M. Bracken, and that burial followed in the Odd Fellows Cemetery in Smithfield. The little girl was photographed in her casket as a remembrance, perhaps the only image of her that exists. View the photo. Name the non-explosive gases found in mines. Give their symbols and specific gravities. Where are they found? What are their effects on life and combustion? What will be the total pressure due to friction in an air-way six fee high, 10 feet wide, and 15,000 feet long, using .00000002 as the coefficient of friction; and what will be the reading of the water gauge? What dangers would you anticipate in a dry, dusty, non-gaseous mine? What precautions would you adopt in this class of mine to safe-guard the workmen? What are the principal causes of mine fire? In September 1925, Charles and Perie attended the third annual reunion of the Ramsey family, held at Sheets Hill. The Courier reported that Perie was named to the committee on arrangements. Yet he kept a distance from his Minerd kin. Recalled his daughter many years later, "We were never too friendly with that side of the family. My dad didn't bother with his relatives. He was a loner where his family was concerned, except his immediate family." He is pictured standing with well-dressed friends at the Smithfield railroad station in Marci McGuinness' book, Yesteryear in Smithfield and Point Marion. During World War II, the Minerds worried as their son Charles Irvin "Bud" Minerd and son in law Clarence W. Conn both served in the armed forces. Bud is named on a plaque on the Smithfield (PA) War Memorial, seen here. Charles suffered for many years from hardening of the arteries and heart disease. He was stricken with a heart attack and passed away suddenly at their Woodbridge home at the age of 64 on July 16, 1953. His funeral was held in the Vance Funeral Home, Smithfield, led by Rev. Walter Lansberger of Beaver Falls, PA, assisted by C.L. Holmes. He was buried at the Odd Fellows Cemetery in Smithfield. Perie outlived Charles by 23 years. She died in 1976, and rests beside him for eternity. Daughter Alice Catherine Minerd (1907-2002) was born in 1907. She married Clarence W. Conn (1908-1987) in 1934 in Hampshire, WV, when she was 30 years of age, and he 29. Clarence later served in the U.S. military during World War II. Alice was a graduate of California State Teachers College, now known as California University of Pennsylvania. She taught elementary education for 26 years, from the 1920s to the 1940s, at North Braddock near Pittsburgh and then at Pleasant Hill and York Run in Georges Twp., Fayette County. Clarence died on June 9, 1987, and was placed to rest in the Odd Fellows Cemetery in Smithfield. Alice outlived her husband by 15 years. She was interviewed in April 1992 by the founder of this website, seeking information about the family. Alice passed away at the age of 94, in Country Care Manor in Fayette City, Fayette County, on May 26, 2002. Son Charles Irvin "Bud" Minerd (1917-1988) was born on Sept. 19, 1916. He married Freda Swaney, who was a longtime teacher in the Smithfield-Fairchance area. They had one daughter, Marla Gene Barnhart. During World War II, Bud served as a first sergeant in the U.S. Army. He trained at Fort Lewis and in several camps before being shipped to England. While on active duty in the European Theatre, he served in France, Holland and Germany. He was honorably discharged on Dec. 30, 1945. After returning home, Bud was a member of the Smithfield United Methodist Church [and] the Gleaners Sunday School Class," said a Uniontown newspaper. Their address was Box 380, Smithfield. Freda is mentioned in the book, Fairchance Through the Years. Bud died on July 7, 1988, at the age of 71, at their residence in Smithfield. His name appears in bronze on the World War II memorial in Smithfield, and is pictured in the book Young American Patriots, World War II, Pennsylvania. Son James Thomas "Tom" Minerd (1910-1975) was born in 1910. He married Mary "Gene" Malone ( ? - ? ). They had two sons -- Charles E. Minerd and Thomas I. "Tim" Minerd. The family lived in Smithfield and later moved to Cleveland. Tom was a longtime coal miner. When he was age 23, in October 1935, Tom and Ernest Malone traveled to Cleveland to view a baseball doubleheader between the St. Louis Browns and Cleveland Indians, a news item printed in the Uniontown Daily News Standard. He passed away on Oct. 28, 1975 in Sinai Hospital in Cleveland. In the program booklet for the funeral service was written: "J.T. was his own man in every way -- and always was. He was opinionated on all subjects and well informed on many. He cherished his family and friends in a way no one would guess. When he smiled, he made the day begin for those around him, and when he yelled, his loved ones knew it was all in jest. He believed in God, and never once lost his faith. He was married to the same woman for 38 years and one long summer and liked to brag about it." His body was donated to Case Western Reserve Medical School for research. Mary Gene and her family have attended our reunions. Seen here, Tom and Mary Gene Minerd hiking in the woods at a time when he was not working during a coal miners' strike. Grandson Charles E. Minerd (1941-2006) was born in 1941. He was a longtime teacher with the Woodland Hills School District near Pittsburgh. Reported the Valley Independent, "In his early hears, he was the youngest Eagle Scout in the state of Pennsylvania. He was a former assistant varsity baseball coach for the Churchill School District, head football coach at Wilkins Junior High School and a youth baseball coach at Charleroi." He was mentioned as a "lovable history teacher" in the Nov. 18, 1998 edition of the InPittsburgh Newsweekly newspaper, in a story entitled "Ricki & Me." He married Rosemarie (DuJordan) Doerfler (1937-2014), daughter of Henry and Julia (Hega) DuJordan Sr. Rosemarie had been married once before and brought two children to the marriage -- Gregg Doerfler and Jody Cheplic. Rosemarie served on the Charleroi (PA) Planning Commission and was active with the Mary , Mother of the Church; Charleroi Goodwill Club; American Cancer Society's Relay for Life; the Make-a-Wish Committee; classic car shows; the Charleroi Youth Baseball League; and the Superstars. Charles passed away on Jan. 7, 2006, at the age of 65. Rosemarie survived her husband by eight years, residing in Charleroi. Said the Valley Independent, she "loved the Steelers, John Wayne cowboy movies, family dinners and holidays." She passed away at the age of 76 on Nov. 2, 2014. Following a funeral service, she was interred in the Sacred Heart Cemetery. At her death, she was survived by three grandchildren. Grandson Thomas I. "Tim" Minerd ( ? -living) married Sandy. They had three daughters -- Jennifer I. Minerd, Jessica Benhie and Maggie Gedebou. They resided in Richmond, VA in the early 1970s. Later, Tim served as director of community development for Montgomery County, MD, a prominent suburb of Washington, DC, and often was quoted in newspaper articles, including the Washington Post, among others. After retirement, they moved to Tucson, AZ. Son Wade Lorenzo Minerd (1897-1966) was born in 1897. Circa 1916, at the age of 19, he and Nettie Price produced a baby daughter. Sadly, the baby died at birth on May 5, 1916 and was never named. The tender remains were buried in Fairchance's White Rock Cemetery. He married Sarah Elizabeth Farr (1895-1977), the daughter of William and Ella (McLean) Farr of Dunbar, Fayette County, PA.
Sarah is seen here in a stark black and white image. In an interesting twist, her first cousin Nellie Fullem married Wade's cousin George Theodore Minerd Sr. (of the family of James William Minerd, also of Dunbar). Wade registered for the military draft during World War I, and listed his employer as Rich Hill Coal and Coke Company of Outcrop, PA. They resided in Clarksville, Greene County, PA. The Minerds had 10 children -- Lawrence "Dean" Minerd, Ralph Lorenzo Minerd, William Byron Minerd, Frances Rae Hall, Thomas Minerd, Clifford John "Tip" Minerd, Winona Lee Robbins, Charles Delbert Minerd, Layvonne "Bonnie" Dayton Watson and Margery Irene Powers Heisser. A newspaper once said that Sarah "was a housewife and had resided at Clarksville for the past 46 years. She was a charter member of the United Missionary Church at Clarksville." During World War II, four of their sons served in the U.S. Army. Sons Clifford, Ralph, William and Thomas Minerd all served in World War II. Three of the brothers are pictured in a composite portrait, with William at top, Ralph at bottom left and Thomas at bottom right. Having not seen each other for nearly four years, Ralph was digging a foxhole in France one day when to his great surprise his brother Thomas drove up in a jeep. "Even though their visit was short," said a newspaper, "it will be one long remembered, they stated in letters home." Ralph was part of the Sicily, North Africa and Southern France invasions as a member of the 62nd Anti-Aircraft Battalion and later the 409th Infantry Division, attached to the Seventh Army. He wounded "somewhere in Germany" on March 21, 1945, less than a month before the war ended. His parents were notified by the War Department, and Ralph's photograph and related news article were published in a local newspaper. He survived, as did his brothers, and returned home after the war. Wade suffered from rheumatoid arthritis for many years and was wheelchair bound. He died on May 5, 1966 at the age of 69. Burial was in Greene County Memorial Park. Sarah survived Wade by 11 years and made her home in House 43, Teegarden Homes in Clarksville. Sadly, she also outlived three of her adult children -- Frances, Dean and William. She passed away at the age of 81,at Greene County Memorial Hospital, on April 2, 1977. At her death, she was survived by 31 grandchildren, 14 great-grandchildren and three step-great grandchildren. She was laid to rest beside her husband in Greene County Memorial Park. Son Lawrence "Dean" Minerd (1914-1973) was born in 1914. At age 20, he married 18-year-old Della Paci (1916-1994), the daughter of Luigi "Lewis" and Josephine (Furmani) Paci of Italy. They were wed on Dec. 6, 1934 and resided in Clarksville. Their four children were Jean Szopo, Louise Salko, Dean Lawrence "Bud" Minerd Jr. and William Emil "Bill" Minerd. Dean was a longtime coal miner, employed by Hillman Coal and Coke Company as weighmaster circa 1940. He also worked for the United Mine Workers of America, where he was a member of Chartiers Local 6330. Dean was active in the community, serving on the Morgan School District board at a time when it combined into the Jefferson-Morgan Joint School District board of directors and oversaw the completion of a new building. Dean also was a volunteer with the Clarksville Volunteer Fire Company. He suffered from black lung disease from his many years in the coal mines, and died at the age of 59 on Aug. 19, 1973. His remains were taken for interment to Greene County Memorial Park. Della outlived him by 21 years. Said the Beaver County (PA) Times, she "was a houseparent at the Youth Development Center, Waynesburg, from where she retired in 1981, and had also been a waitress in different area restaurants. She had spent most of her life in the Clarksville area and in the Burson Plan area since 1944. She was a member of the St. Thomas Roman Catholic Church, Clarksville; the Clarksville Volunteer Fire Company Auxiliary, and the State Employees Retirement System." She died on March 25, 1994, at the age of 78. Della's funeral mass was celebrated at St. Thomas Roman Catholic Church of Clarksville, followed by burial beside her husband. In 1996, when G. Wayne Smith's book History of Greene County Pennsylvania was published, Dean was mentioned in connection with his work on the Jefferson-Morgan School Board. Granddaughter Jean E. Minerd (1936-living) was born in about 1936 in Morgan Township, Washington County. In about 1956, at the age of 20, Jean wed Louis Steven Szopo (1934-2013). Their marriage endured for 57 years until cleaved apart by the Grim Reaper. The couple produced three children -- Carolyn Kittner, Robert Szopo and Thomas Szopo. The family resided for many years in White Township near Beaver Falls, Beaver County, PA. Lou served in the U.S. Army during the Korean War. During his working career, he was employed by Babcock & Wilcox, Gross Furniture and NAPA Auto Parts. Said the Beaver County Times, he was "an avid golfer and a member of the Beaver Falls Owls Club." He died at the age of 78 on Feb. 15, 2013. Grandson Louise D. Minerd (1937- ? ) was born in about 1937. She married Jack Salko ( ? - ? ) on June 30, 1956. They had four children -- Marla Jean Salko, Tristina Louise Sako, Jacquie Manches and John William Salko. Sadly, their daughter Marla Jean died in 1991 at the age of 34. Grandson Dean Lawrence "Bud" Minerd Jr. (1939-2014) was born on Dec. 30, 1939 in Chartiers, Washington County. He married four times -- to Jan Mollissey, Joanne Tennant Barclay, Janice Stark and Maureen Brady -- but did not reproduce. He served in the U.S. Marine Corps. Circa 1972, Dean was employed with Fuchhart-Fuellhart-Rowland Communications Construction, Inc, and also worked a supervisor for several other cable television companies. He also labored as a coal miner at Chartiers Mine and was employed in sales for Paletta Ford in Fredericktown. Said a newspaper, "For several years he was the manager for the traveling league women's softball team sponsored by the Jefferson Hotel. He was an avid sports fan and loved animals." He died at the age of 74 on Oct. 17, 2014 in Advanced Personal Care , Clarksville. Grandson William Emil "Bill" Minerd Sr. ( ? - ? ) was born in (?). He was united in holy matrimony with Kay Cecchini ( ? - ? ), daughter of Natale and Katy (Packrall) Cecchini of the Fredericktown-Millsboro area of Washington County. He was employed by Gross Furniture Company in Fredericktown, Washington County, circa 1967. The Minerds have borne three children -- William Emil Minerd Jr., Gina Marie Zibrida and Christopher Minerd. Over the years, they have made a home in Denbo Heights and Milford Terrace, part of Millsboro, Fayette County. The family grieved in April 1988 when Kay's brother, a Beth-Center high school teacher, was killed when a tractor he was using to remove a tree stump flipped and crushed his body. Son Christopher is the athletic director and girls basketball coach at California (PA High School and in January 2017 achieved his 100th victory for the Trojans. Son Ralph Lorenzo "Frecks" Minerd (1917-1996) was born prematurely in 1917, and as a boy, survived a shooting in the face and neck. As a young man, during World War II, he received a Purple Heart for a shrapnel wound in his leg while serving in Germany, and seven Bronze Stars for his military service. He also claimed to have marched from North Africa to Italy during the invasion. 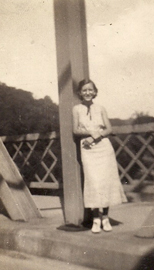 Ralph married Sophie Margaret Wunder (1918-1989), also seen here (on a bridge in Greene County, PA) the daughter of John Phillip Wunder of Fredericktown. Sophie's father, a longtime coal miner, wrote poetry, and in fact in 1922 submitted two of his choicest selections to the United Mine Workers Journal, but received a rejection from the editor on the basis that there was no space on the pages to devote to poetry. The Minerds migrated to Chicago. They were the parents of five children -- Michael Rogan Minerd, Patrick Wade Minerd, Sarah Marie Potter, Margaret Rose "Peggy" Konieczny and Mary Lorene Zemaitis Speegle. Their home was in Burbank, IL. Margaret died on June 30, 1989. Ralph survived his wife by more than seven years. He succumbed from the effects of an aortic aneurysm on Nov. 22, 1996, at the age of 82. They rest at Mt. Auburn Cemetery. Minerd and Wunder descendants held their first reunion in the Chicago area on June 26, 2010. Grandson Michael Rogan Minerd (1953-2005) was born on July 17, 1953 in Chicago. He was married and produced three sons -- Timothy Minerd, Brian A. Minerd and Kevin Minerd. Michael earned a living over the years as a sheet metal worker and machinist. At one point, he helped in a project with the scoreboard at old Comiskey Park, home of the Chicago White Sox. Circa 1989, he made his home in Vinemont, AL. He attended the Catholic church. Circa 2005, he dwelled in Murfreesboro, TN. Tragically, on Dec. 15, 2005, he passed away at the age of 52, on the 14th anniversary of his brother Patrick's death. An obituary was published in the Chicago Tribune and the Murfreesboro Daily News Journal. Grandson Patrick Wade Minerd (1954-1991) was born in 1954. He married Karen Patterson ( ? -living). Their children were Courtney Howell, Becky Cantrell and Amy Horton. Sadly, Patrick died on Dec. 15, 1991. Their daughter Amy (1973-2018) was married to (?) Horton and Godfrey Karuri ( ? -living). She had three offspring. At the age of 44, Amy died at home in Norcross, GA on March 20, 2018. Burial was in Ider, AL. Granddaughter Sarah Marie Minerd (1956-2012) was born on the Fourth of July 1956 in Chicago. She married (?) Potter and produced two daughters, Tammy Dickey and Lynn Connell. She resided in Cullman, AL in the 2010s. Suffering from a serious illness, she was admitted to the U.A.B. Hospital where she died at the age of 55 on Jan. 25, 2012. Burial was in Ebenezer Cemetery with Rev. Steve Britt officiating at the funeral service, with Wesley Barbee, Patrick Flanagan, Matt Hallmark, John Dickey, Allen Connell and Ky Connell serving as pallbearers. The Cullman Times printed an obituary. Granddaughter Margaret Rose "Peggy" Minerd wedded (?) Konieczny. Granddaughter Mary Lorene Minerd was twice married. Her first spouse was (?) Zemaitis. Later, she was joined in holy wedlock with (?) Speegle. Mary graciously has provided a wealth of family history material about her branch for this website. Son William Byron Minerd (1920-1974) was born in 1920. William resided in Clarksville and later in Youngstown, Mahoning County, OH. He married Theodora "Dora" Triantafilos (1924-2003). They had eight children -- Sandra Freedman, Frances "Francie" Freedman, Marilyn Minerd, James Minerd, Thomas Minerd, Charles T. Minerd, Chris Minerd and John Minerd. During World War II, he served as a U.S. Army private with the 38th Engineers. He was shipped overseas in February 1942 and "spent seven months at secret bases," said a newspaper. "He later spent 19 months in Belgium Congo, Africa, after which he was sent to England until D-Day, when he participated in the invasion." William returned home safely upon the war's conclusion. 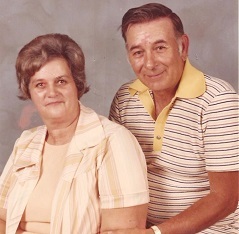 William and Dora divorced in Mahoning County in October 1970. He suffered from lymphoma and died at the age of 53 on Jan. 10, 1974, in Youngstown's St. Elizabeth Hospital, following a brief illness. He is buried at Belmont Park Cemetery in Youngstown. Said to have been very sickly as an adult, she outlived William by nearly 30 years, and died at the age of 79 on Dec. 9, 2003. Son Charles T. Minerd ( ? - ? ) wed Kathy Franke. They lived in Boardman, Mahoning County, and had two known daughters, Carley Minerd and Karen Minerd. Sadly, daughter Carley (1991-1996) died at the age of four on Aug. 4, 1996, before she could receive a transplant for an ailing heart. Sarah Elizabeth (Farr) Minerd, left, and her daughter Frances Rae (Minerd) Hall. DaughterFrances Rae Minerd (1922-1976) was born on Nov. 3, 1922 in Smithfield. 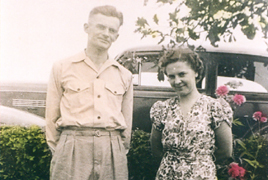 At the age of 27, on June 12, 1950, she eloped to Winchester, VA to married 31-year-old John Edward Hall Sr. ( ? - ? ). (Other sources give the marriage date as July 10, 1947.) Local Presbyterian minister Rev. J.S. Duckwall officiated. John was the son of Edward and Myrtle (Wilson) Hall and worked as a millwright at the time of marriage. They resided on Oak Street Extension in New Bedford, OH and had four children -- John Hall, Holly Quinn, William Hall and Sharon "Sherry" Manchester. They were members of the church of Christ of Girard, OH. Sadly, son John II lost his life in an automobile accident in October 1974, when his car rolled over an embankment. Frances passed away in her home on Oct. 6, 1976, at the age of 53. Her obituary was published in the New Castle (PA) News, and perhaps other newspapers. Following a funeral led by Rev. Robert Johnston of the family church, she was laid to rest in Evergreen Cemetery in New Bedford. Grandson John Hall II was killed in October 1974 in an automobile accident. Granddaughter Sharon "Sherry" Hall wedded (?) Manchester. 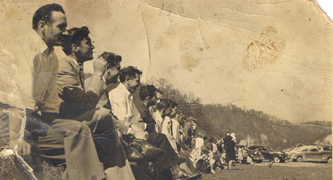 Brothers Ralph "Frecks" Minerd (left) and William Minerd (6th from left) enjoy a baseball game near Clarksville in 1949. See our August 2009 "Photo of the Month" for more. Son Thomas Minerd (1925-1985) was born on Feb. 21, 1925. He joined in the military in June 1942 at age 17 during World War II. He was a member of the 79th Infantry Division of Patch's Seventh Army, a unit commended "for making the fastest progress (1800 yards in 72 hours) of any infantry division in warfare," reported a newspaper. "Also awarded a citation for their skill near Strasbourg, the unit was the first to cross the Seine River and the Belgium border. First stationed in England, he participated in the D-Day invasion and fought in the battle for Cherbourg. Moving on across France, he fought in several battles under General Patton." After the war, Thomas labored as a coal miner in Clarksville, Greene County, PA. He was married twice. His first wife was Mary Jane Weston (1927- ? ), daughter of Albert and Margaret (Wells) Weston and a native of Orient, Fayette County. Their wedding was held in Winchester, VA on July 2, 1948 by the hand of Rev. J.S. Duckwall. They made a home in Youngstown, Mahoning County, OH and had two children -- Linda McClary and Lynn Delmark. The couple divorced on Aug. 8, 1978, and Thomas made a home at 7053 West Boulevard. Then on May 13, 1981, in nuptials held in Winchester, VA, Thomas wed Ruth Esther "Tic" (Haines) Bailey (June 18, 1924-2017). She was a native of Greene Township, Greene County, PA and the daughter of James Irwin and Mary (Waychoff) Haines. She had three children from a previous marriage to George M. Bailey -- Gerald M. Bailey, Denzil Bailey and Lisa Hess. They made their home Youngstown, where Thomas lived from 1949 to 1981. He was a longtime employee of Republic Steel Corporation, and an honorary member of United Steelworkers of America Local 1331. He later relocated to Florida, making his home in Gainesville, Alachua County. Thomas passed away there, of an aortic aneurysm, at the age of 60 on Feb. 28, 1985, with his obituary published in the Youngstown Vindicator. Ruth survived her husband by 32 years. Said the Washington (PA) Observer-Reporter, "She worked at the former youth development center as a house parent for 20 years and sold Avon products for about 15 years and had made many friends on her routes. She hunted deer most of her life on the farm, where she killed several doe. She killed her first and only buck at the age of 82 and quit hunting at 85, but was still eager to know how everyone did hunting." She spent her final years in Carmichaels, Greene County and was admitted as a patient to Waynesburg Health and Rehabilitation Center. She died there at the age of 92 on Jan. 2, 2017. Her remains were donated to science. Daughter Lynn Minerd married (?) McClary and resided in Cleveland, OH. Daughter Linda Minerd wed (?) Delmark and made her home in 1985 in Gainesville. Son Clifford John "Tip" Minerd (1927-1990) was born on Sept. 7, 1927. He was a member of the 271st Infantry Division in the Army during World War II. He entered the military in August 1944, received basic training at Camp Wheeler, GA, and was sent to Europe in January 1945. He was stationed in Germany toward the end of the war. Once returning home, he stayed in Uniontown for several years. In the fall of 1949, he and some Uniontown friends got into some trouble with the law for speeding and "misuse of license plates," reported the Connellsville Daily Courier. Later, Clifford relocated to Chicago, where on Jan. 30, 1954, at the age of 26, he married 33-year-old Clara Strozyk (Aug. 7, 1921-2013), daughter of Lawrence and Frances Strozyk. The marriage endured for 36 years. They established a home in North Little Rock, AR, and resided there for many years. The Minerds did not reproduce. Clara was a longtime member of the Immaculate Heart of Mary Catholic Church and its Rosary Sodality and Altar Society. At the age of 63, Clifford died in Little Rock on Dec. 14, 1990 and was buried at Immaculate Heart of Mary Cemetery in Little Rock. Clara survived her husband by 23 years and remained in Little Rock. She was carried away by death on Sept. 18, 2013. A mass of Christian burial was held in the family church, with interment in the church cemetery. Daughter Wynona Lee "Winnie" Minerd (1930- ? ) was born in 1930 in Chartiers, Washington County, PA. At the age of 20, she was employed as a selector. When she was 20 years of age, she eloped to Winchester, VA on Dec. 22, 1950 to wed 22-year-old stockroom clerk Richard Robbins ( ? - ? ), son of George and Martha (Bennett) Robbins of Camden. NJ. Performing the ceremony was local Presbyterian minister Rev. Ronald S. Wilson. The Robbinses made their home for many years in New Jersey. Circa 1977, they were in Bridgeton, NJ. They had one daughter -- Karin Robbins. Son Charles Delbert Minerd (1932-1985) was born on Sept. 27, 1932. He attended Pitt Gas School in or near Clarksville, Greene County. As a young man, he served in the U.S. Army. Charles married Josephine Medunic ( ? - ? ), daughter of Anthony and Josephine (Johngarlo) Medunic of Greene County. They relocated to the Cleveland, Ohio area, and produced four children -- Gary Minerd, Karen Minerd, Kenneth Minerd and Brian Minerd. Charles passed away on Feb. 15, 1985, at the age of 53, just 13 days before the death of his brother Thomas in Florida. Following a funeral mass sung at Our Lady of Mt. Carmen Church (West), his remains were laid to eternal rest in Holy Cross Cemetery. Josephine survived her husband by several decades. In 2012, her home was in Rocky River, OH. Grandson Gary Minerd (1965-2006) was born in 1965. A well known community member in the Cleveland suburb of Westlake, Gary died young at the age of 41, leaving a wife and four young children. He was buried at St. Joseph Cemetery. On Aug. 20, 2007, the Gary Minerd Memorial Golf Classic was held at Avon Oaks Country Club in Westlake, with proceeds to be used for the future education of his children. Daughter Layvonne Lois "Bonnie" Minerd (1936-2005) was born in 1936 in Chartiers, Washington County, PA. She twice married. Her first husband was 22-year-old machine operator Robert E. Dayton (1935- ? ). The couple eloped to marry in Winchester, VA, with their nuptials held on Jan. 19, 1957, by the hand of Methodist minister Rev. W.C. Eastridge. At the time, Robert made a home at 1581 East 115th Street in Cleveland. The couple eventually divorced, with Bonnie supporting herself as a secretary. At the age of 32, she again eloped to Winchester to marry 36-year-old welder Robert Walter Watson (1931-2003), son of Clifford and Gertrude (Teagarden) Watson. The wedding was held on May 11, 1968, with court-appointed A.M. Gooden Jr. officiating. They resided in Clarksville. Robert was an inspector on roadways for SAI, a welder and a coal miner at Vesta 5 Mine," reported the Washington Observer-Reporter. During the Korean War, he served in the U.S. Army. Said the Uniontown Herald-Standard, she "was a homemaker, and retired controller for Omni Packaging at Washington [PA]." Bonnie, who came to several of our reunions in the early 2000s, went as a widow to live in Rocky River, OH. She died on May 10, 2005, in Manor Care Nursing Home in North Olmsted, a suburb of Cleveland. Daughter Margery Irene Minerd (1938- ? ) was born in 1938 in Pitt Gas, Greene County, PA. At the age of 19, she made a home in Cleveland, Cuyahoga County, OH and was employed as an assistant advertising manager. On Aug. 2, 1957, the 19-year-old Margery eloped to Winchester, VA to wed her first spouse, 21-year-old machine hand David T. Powers (1936- ? ), son of David D. and Gertrude (Garney) Powers. Rev. Joseph S. Duckwall, of the local Presbyterian church, officiated. At the time of marriage, David's home was at 3515 West 50th Street, and hers' at 3715 East 61st Street. Later, she married Wayne Heisser ( ? - ? ) and they have lived in Lakewood and Rocky River, OH. They have four children -- Mark Heisser, David Heisser, Robert Heisser and Robin Heisser -- and seven grandchildren. Margery and her sister Bonnie came to our 2002 reunion. 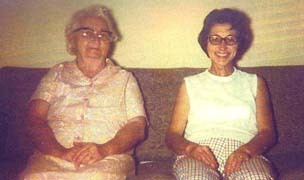 Front, l-r: Josephine (Medunic) Minerd, Winona (Minerd) Robbins, Layvonne "Bonnie" (Minerd) Watson and Margery (Minerd) Heisser. Back, l-r: Richard Robbins, Robert Watson and Wayne Heisser. Daughter Myra Minerd (1899-1986) was born on June 4, 1899. As a teenager, she attended the Weaver School (1914) and the Paull School (1915). 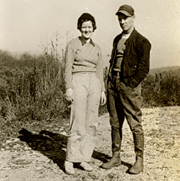 When she was age 19, Myra eloped to Cumberland, Allegany County, MD to marry 19-year-old Ray Andrew Kennison (June 15, 1899-1982), son of Emerson J. and Bessie E. (Robinson) Kennison of Smithfield. The nuptials took place on the Fourth of July 1918, officiated by Rev. J.W. Balderston of the Methodist Protestant Church. News of their marriage license was published in the Pittsburgh Post-Gazette. The Minerd and Kennison families were close, and Myra's sister Grace wedded Ray's brother Lloyd. The Kennisons lived at White House, near Smithfield, and had two daughters, Edith Kingan and Janet Moody. In 1920, when the federal census was enumerated, Myra and Ray and nine-month-old daughter Edith made their home in Springhill Township, Fayette County. Ray was employed that year in local coal mines as a "shot fixer." Living a few doors away were Myra's widowed father and unmarried sister Grace. 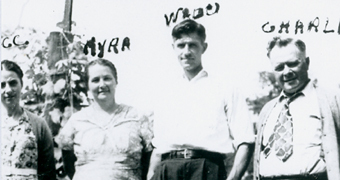 When the federal census enumeration again was taken in 1930, the family is shown in Springhill, with Ray continuing to earn a living as a coal miner. The Kennisons held a 16th birthday party for their niece Edith in April 1935 at their home in White House. Myra was a member of the White House Club during the 1940s. Myra and Ray served as executors of the estate of John H. Darby of Springhill Township in 1943. They are known to have entertained a visit from Myra's cousin James William Worrick Sr., of the family of Jennie (Minerd) Herrington Worrick in November 1939 and from Myra's brother Wade and family in February 1945. In the late 1960s, as grandchildren were being born, they received a happy surprise when their daughter Edith bore twin sons. Ray passed away on Feb. 19, 1982 at the age of 82. Myra spent her final years living under the roof of her married daughter Edith Kingan. Myra died on Feb. 18, 1986, at the age of 87. The Uniontown Herald-Standard reported that she was survived by five grandchildren and 10 great-grandchildren. Grandson Larry Edward Kingan ( ? - ? ) served as a radioman in the U.S. Navy during the Vietnam War. He and his twin brother Gary completed a five-month tour of duty aboard the U.S.S. LaSalle. In July 1971, he married Sherry Lynn Baird, daughter of Charles Baird of Collier. Their nuptials were held in the Fairchance Church of the Brethren, with Rev. George W. McLaughlin officiating. The Uniontown Morning Herald printed a story about the wedding, including Sherry's bridal portrait. They live in Smithfield. Grandson Gary Kingan ( ? - ? ) was a radioman with the U.S. Navy during the Vietnam War, as was his twin brother Larry. In about June 1967, Gary wedded Linda Bittinger, daughter of William Bittinger of Fairchance. The couple were the parents of Michele Lee Kingan and Balerie Kay Kingan. They dwell in Fairchance. Daughter Janet Kennison (1926- ? ) was born in about 1926 in White House near Smithfield. She was eight years younger than her sister. She wed George Moody ( ? - ? ). Circa 1973, they resided in Cleveland, Cuyahoga County, OH, and had three daughters -- Judy Moody, Kathy Moody and Sandy Moody. Janet was still alive circa 2004 when named in the obituary of her sister. Daughter Grace Minerd (1901-1954) was born on July 2, 1901 in Smithfield. She attended the Weaver School with her sister Myra circa 1914. 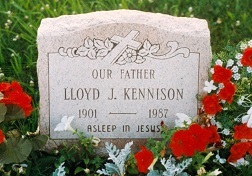 She married Lloyd J. Kennison (1901-1987), son of Emerson J. and Bessie E. (Robinson) Kennison. 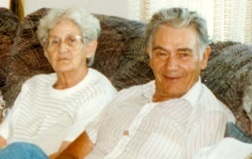 The two families were close, and Grace's sister Myra married Lloyd's brother Ray. They resided in the Smithfield area for four decades. The couple bore five children -- Alice Catherine Monahan, James E. Kennison Sr., Roy "Bic" Kennison, Robert Allen Kennison Sr. and an infant who died at age two days in 1921. In late December 1936, when Grace was age 35, she is known to have undergone surgery at a local hospital and spent two weeks recovering there before returning home to convalesce. The U.S. Census of 1940 lists Lloyd's occupation as a heavy machinery laborer. Sadly, while at home, Grace suffered a cerebral hemorrhage and died at age 53 on Oct. 23, 1954. An obituary in the Connellsville Daily Courier noted that she was survived by a dozen grandchildren. Lloyd placed a card of thanks in the Uniontown Evening Standard, sayig "We wish to express our sincere thanks and appreciatin to our friends, neighbors and relatives for their kindness and sympathy during our recent bereavement inthe loss of our beloved Wife and Mother, Grace Kennison, Also to Rev. Eckman, the singers, pallbearers, those who sent floral tributes and to those who assisted in any way." Later in the 1950s, Lloyd married again to Sylvia Mae Boring (1917-2008), daughter of Abraham L. and Martha A. (Timmeney) Boring. The couple had two more children of their own -- Mark Kennison and Lois Kennison. Sylvia was "an ordained minister of the Free Methodist Conference for 64 years," said the Uniontown Herald Standard, and was a member of the Little Brownfield Free Methodist Church. Lloyd passed into eternity on Oct. 3, 1987. Sylvia outlived her husband by more than two decades. She died at the age of 91 on Oct. 4, 2008, at Markleysburg, Fayette County, PA. Daughter Alice Catherine Kennison (1922-2018) was born three days before Christmas in 1922. On Sept. 7, 1943, when she was 20 years of age, she slipped away to Oakland, MD to marry 19-year-old Harold Lloyd "Bud" Monahan (July 2, 1923-1989), son of William Monahan of Smihfield. Local Methodist clergyman Rev. Johnson officiated, and the Uniontown Evening Standard reported that "There were no attendants. The bride wore a blue gown with turf tan accessories." Their home was in White House near Smithfield. As a young man, Harold had labored for the Fancy Hill Coal Company. Then after the outbreak of World War II, he served with the U.S. Army, training at Fort Sill, OK before deployment to England. They produced two children, Harold Scott Monahan and Sandra Hoferka. Sadly, they endured the death of their son Harold in September 1961. Harold passed into eternity at the age of 65 on Jan. 19, 1989. Alice survived for almost 30 years and in abouit 1996 met the founder of this website during a visit in Smithfield. Alice eventually relocated to be near her daughter in Hueytown, AL. She died at the age of 95 in Hueytown on April 24, 2018. Her remains were returned to Smithfield for interment in Mount Moriah Baptist Cemetery, with Rev. Chuck McLaughlin leading the funeral service. Grandson Harold Scott Monahan (1958-1961) was born on Aug. 27, 1958 in Uniontown. Sadly, at the age of three, he contracted diabetes and, added to acidosis, he died on Sept. 13, 1961. Interment was in Mount Moriah Cemetery. Granddaughter Sandra Monahan ( ? -living) was born in (?). She wedded Joseph Hoferka ( ? -living). They relocated to Hueytown, AL and produced two sons -- Charles Todd Allton and Joseph Hoferka. 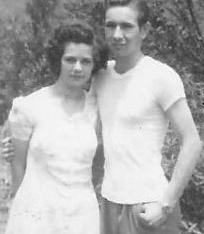 Son James E. Kennison Sr. (1925-2009) was born on July 23, 1925 in Whitehouse near Smithfield, Fayette County. He served with the U.S. Armed Forces during World War II, with induction taking place in Greensburg, Westmoreland County in May 1943 and James' name printed in the Pittsburgh Post-Gazette. He married Margaret R. Colebank (1926-2006), daughter of Wayne Colebank. 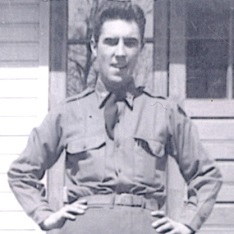 He was stationed in West Virginia and Camp Phillips, KS circa 1943, where he trained in field artillery. James, Margaret and their son James were pictured together in the Uniontown Morning Herald on Sept. 15, 1944, in celebration of the son's first birthday, with Margaret residing in Lake Lynn, Fayette County and James "now stationed somewhere overseas." After the war, they made a home at White House near Smithfield in Springhill Township. The couple were the parents of eight children -- James Kennison Jr., Michael Kennison, Dolores Sutton, Linda Leech, Diana French, Carol Seghi, Daniel Kennison and Robin Jarabeck. Said the Herald-Standard, James "was a veteran of World War II who served in the European and the African Theatres. Upon returning from the war he was a heavy equipment operator and loved farming." Grief blanketed the family over the years at the untimely deaths of son James (age 22, in 1966) and Michael (age 17, 1975). The family is known to have attended the silver anniversary surprise party for Mr. and Mrs. Frank Myers of Smithfield in October 1964. 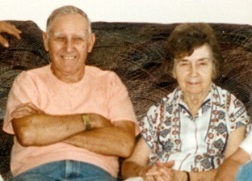 Margaret passed away on June 2, 2006, after 63 years of marriage. She was laid to rest at Mount Moriah Baptist Church Cemetery of Smithfield. She was survived by 11 grandchildren and 10 great- grandchildren, said the Herald-Standard. James lived for another three years. He passed away at the age of 84 on New Year's Eve 2009 as a resident of Horizon Personal Care Home. 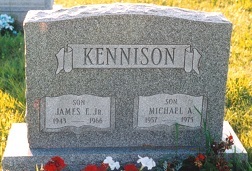 Grandson James E. Kennison Jr. (1943-1966) was born on Sept. 15, 1943 in West Virginia. He developed muscular dystrophy at the age of six and endured the disability for the remaining 16 years of his life. For his 17th birthday in September 1960, he received a wheelchair from the Fayette County Association of Muscular Dystrophy and was pictured in the Uniontown Evening Standard. Also burdened with hypertension, his heart went into ventricular fibrillation and he died suddenly at the age of 22 on Jan. 6, 1966. His remains were placed into repose in Mt. Moriah Baptist Cemetery in Smithfield. Grandson Michael A. Kennison (1957-1975) was born on July 30, 1957 in White House, Fayette County. As a teenager, he was a student in the Albert Gallatin Area School District. Tragically, at the age of 17, he died in Uniontown Hospital on March 13, 1975. Interment was in Mt. Moriah Baptist Cemetery, with an obituary appearing in the Uniontown Morning Herald. Granddaughter Dolores Kennison ( ? - ? ) was born in (?). She was joined in marriage with Ervan "Erv" Sutton ( ? - ? ). They resided on a farm about a mile east of Smithfield and produced three offspring -- Dale Ervan Sutton, Beth DeLorenzo and Christie Sutton. Sadly, Ervan passed away sometime between 2010 and 2018. Dolores endured further heartache when her son Dale, married with three children and a grandson, died at the age of 44 on June 3, 2018 following a brief illness with cancer. Granddaughter Linda Kennison was united in wedlock with Joseph French and later with Larry Leech. The Leeches make a home in Smithfield. Granddaughter Diana Kennison wedded Stanley French. They live in Smithfield. Granddaughter Carol Kennison married Albert W. Seghi Jr., believed to be the son of Albert W. and Gladys (Jones) Seghi Sr. of Brownsville, Fayette County. They dwell in Smithfield. Grandson Daniel Kennison was joined in holy matrimony with Judy. They reside in Smithfield. Granddaughter Robin Kennison was united in marriage with Robert Jarabeck. In 2010, their home was in Painesville, OH. Son Robert Allen "Debo" Kennison Sr. (1928-1989) was born on Sept. 27, 1928. He married Joanne Colebank (1930-2010), daughter of Wayne and Ellen (Beatty) Colebank and a native of Morgantown, Monongalia County, WV. The Kennisons had 10 children -- Robert Allen Kennison Jr., Luanne Myers, Susie Wiles, Rita Reese, Rich Kennison, Donald Kennison, David Kennison, Cindy Everly, Debbie Bennett and Lori Myers. Robert died in 1989 at the age of 61. Joanne survived her spouse by 21 years. She passed away at the age of 80 in Sept. 18, 2010. She joined her husband in eternal rest at the Mount Moriah Baptist Cemetery in Smithfield. The Uniontown Herald-Standard noted that she was survived by 26 grandchildren and 16 great-grandchildren. Grandson Robert Allen Kennison Jr. married Rita DeMichele, daughter of Albert T. DeMichele of Republic, Fayette County. They have attended our reunions. Rita served on the planning committee for the "Celebrate the Centuries" in 2000 honoring the 201st anniversary of Smithfield, PA, and also invited the founder of this website to speak at a Smithfield book club. Grandson Richard Kennison dwelled in Smithfield in 2018. Grandson Donald Kennison wedded Linda. They have resided in Cheat Lake, Monongalia County, WV. Grandson David Kennison was united in matrimnoy with Pegg. Their home is in Kingwood, Preston County, WV. Granddaughter Luanne Kennison was joined in wedlock with Howard "Howie" Myers. They live in Smithfield and are the parents of Brian Christopher Myers and Jason Scott Myers. Circa 1975, Howard and his brother in law Robert Allen Kennison Jr. were employed at Lakeview Country Club in Morgantown, WV. Granddaughter Susan Kennison married Brian Riggin and dwell in Smithfield. Granddaugher Rita Kennison wedded Terry Reese. In 2018, their residence was in Smithfield. Granddaughter Debbie Kennison was united in wedlock with Whitney Forquer and make their home in Morgantown, Monongalia County, WV. Granddaughter Lori Kennison was united in marriage with Paul Myers. They live in Salem, OH. Granddaughter Cynthia Ellen Kennison (1959-2018) was born on Jan. 2, 1959 in Uniontown. She married (?) Everly ( ? - ? ). They were the parents of Carrie Kennison, David Everly, Joseph Everly, Paul Everly, Mark Everly and Melissa Everly. Cynthia was employed over the years at Lakeview Resorts, Prime Thyme and B.F.S. On New Year's Day 2005, her granddaughter Faith Lynn Everly was born, and in a headline story the next day, the Uniontown Herald-Standard proclaimed, "Carmichaels Couple Welcomes First Baby of Year." Yet she endured the untimely death of another granddaugher, Mackenzie Everly. Sadly, at the age of 59, Cynthia passed away on April 19, 2018 in Ruby Memorial Hospital in Morgantown. Rev. Andrew Burd-Harris led the funeral service. Son Roy "Bic" Kennison (1931- ? ) was born in about 1931. At the age of 21, in 1951, he worked as a truck driver and was charged by state police with overloading his vehicle and ordered to pay a fine. He married his first wife, Pauline ( ? - ? ). By July 1952, the couple separated, with Roy not complying with a court order to pay support, with Pauline bringing charges in the county domestic court. He made his home at that time in Gans, Fayette County. In June 1953, he was declared in contempt of court and placed in the county jail. Roy was jailed again on charges of larceny in April 1955. He relocated to Albright, Preston County, WV, and apparently continuing to refrain from making support payments, was jailed in December 1960. At some point, he wedded Frances ( ? - ? ) and later resided in in Warsaw, VA.